Insulate pipes-hot and cold-that connect vertically to your water heater. Phase 3 and final paving on Walnut Street was complete in early March 2018. Water and sewer lines in Walnut Street between Mountain and College avenues are some of the oldest in the city, dating back about 100 years. This project replaced these lines, along with some services, and addressed failing infrastructure that causes water quality concerns, low levels of fire protection and maintenance problems. 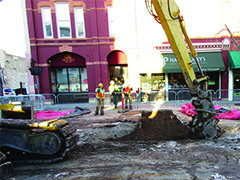 Utilities scheduled the work to be done in phases in 2017 and 2018 to minimize impacts to local businesses, scheduled events and development in the Old Town area. In Phase 1, Utilities replaced sewer line in Walnut Street from Mountain Avenue to Seckner Alley. Old 6-inch clay sewer in Seckner Alley also was replaced with 8-inch pipe using a trenchless technology called 'pipe bursting.' Work was completed on schedule in April 2017. 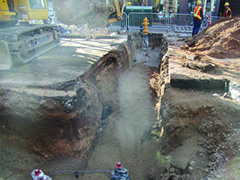 The existing 4-inch waterline in Pine Street was replaced with new 8-inch pipe from Firehouse Alley to Walnut Street in Phase 2. 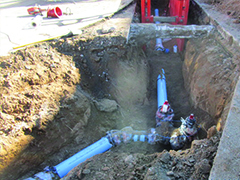 Approximately 240 feet of waterline was installed, along with services and fire lines in collaboration with the Brinkman Exchange development project. Work was completed as planned in September 2017. Phase 3 began Jan. 2 and was completed on March 5, 2018, almost a month ahead of schedule. 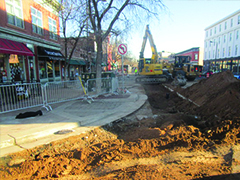 Utilities abandoned two old 4- and 6-inch waterlines in Walnut Street and installed 480 feet of new 8-inch waterline from College Avenue to Linden Street. Two new fire hydrants were installed and water services were connected to the new line. In addition to the original scope of work, the contractor also completed all concrete repairs and a complete rebuild and paving of the road. 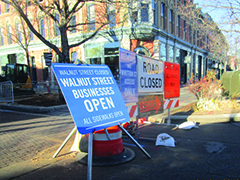 Walnut Street was closed to traffic and parking during construction but deliveries and residential access were accommodated. Sidewalks remained open at all times. Utilities distributed a limited number of parking vouchers to businesses on a monthly basis. In addition, business advertising signage on the construction fencing in the public right-of-way was permitted for the duration of the project.